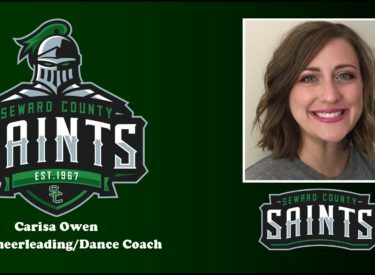 Seward County Interim Director of Athletics Roy Allen announced Wednesday that Carisa Owen has been selected as the next Head Cheerleading and Dance Coach for the Saints. Owen brings over 10 years of cheerleading experience to the table for the Saints Spirit Squads. As a high school cheerleader, Owen was named a team captain and led Henryetta High in Oklahoma to a Regional Championship and a top five finish at the State Championships. Owen is a 2009 Graduate of Southeastern Oklahoma State University earning her Bachelor’s Degree in Communication with an emphasis on Advertising & Public Relations. Upon graduation, Owen moved to Midlothian, Texas with her husband Greg, who is the Saints Head Men & Women’s Tennis Coach. She is the proud mother to Anna, Claire, and Joey.